The White-crowned Sparrow (Zonotrichia leucophrys) is in the same genus-"Zonotrichia"-as two other sparrows with banded or "zoned" heads, White-throated Sparrow and Golden-Crowned Sparrow. 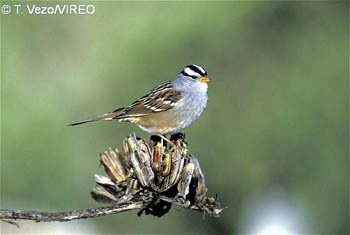 The White-crowned Sparrow has a sharply pointed, pink bill contrasting against a lustrous white-and-black striped head. The White-crowned is a year-round resident in the United States, on the West Coast and in the interior from Nevada to Colorado. In the last fifty years the bird has extended its winter range north and east so that it now encompasses much of the U.S. south of the Great Lakes. The White-crowned Sparrow also has a striking, ethereal song: 1 - 3 high, clear whistles followed by several short, buzzy notes and trills, in somewhat the same pattern as a Song Sparrow. The White-crowned Sparrow is a permanent resident on the U.S. west coast and from Nevada to Colorado, a breeding bird in Alaska, the Northwest territories and the Canadian Arctic, and a winter resident in Mexico and the continental U.S. (excluding most of Florida and the Carolinas) north to the Great Lakes, Oregon, Washington and British Columbia. The White-throated Sparrow is a chunkier bird with yellow lores between the eyes and the bill, a black bill and a well-defined white throat. The Chipping Sparrow is distinctly smaller and has a dark bill, rufous crown (brownish in winter) and a thin, white superciliary stripe (gray in winter) over the eye. The White-crowned Sparrow is a terrestrial bird that nests in open grasslands and low brush. At high altitudes, and in the far northern breeding range, White-crowned Sparrows suffer from occasional snowstorms that destroy their nests. During migration and in winter, White-crowned Sparrows flock with Song, White-throated and, in the West, Golden-crowned Sparrows.